Bajaj, who was born blind due to a “rare retinal condition called Leber’s Congenital Amaurosis” according to an interview on Superlawyer, is a law graduate of Nagpur University who is currently an associate at Trilegal, working in its regulatory team. He was selected as a SpicyIP fellow in 2016, and completed an online course in copyright law from Harvard Law School. Earlier this year, he had interviewed blind senior advocate SK Rungta for Increasing Diversity by Increasing Access (IDIA) about the challenges and successes of being a lawyer with disabilities. 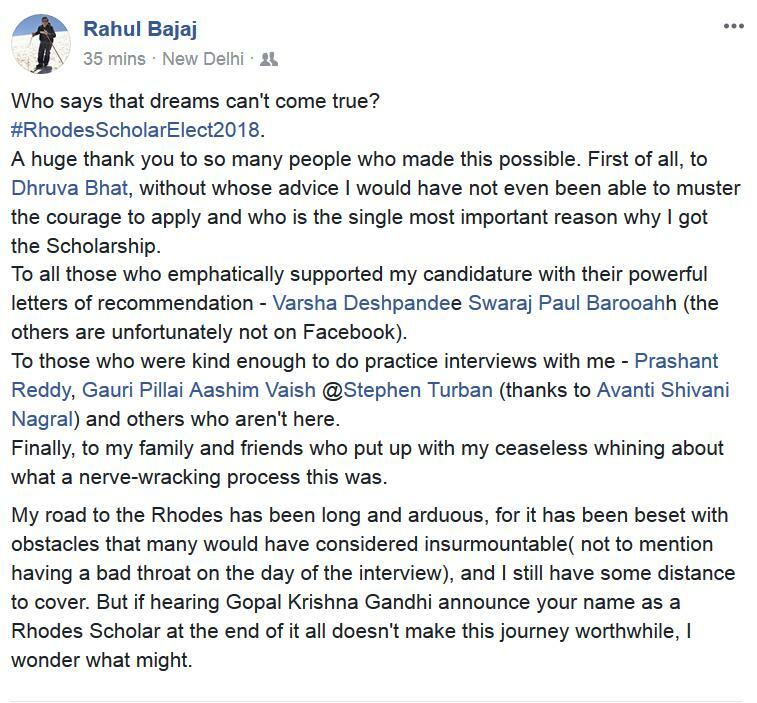 GNLU too celebrated its first Rhodes scholar in Sameer Rashid Bhat, who is due to graduate in 2018, according to several Facebook posts (see below). Bhat hails from Srinagar and has interned at Cyril Amarchand Mangaldas, Fox Mandal, senior advocate Indu Malhotra, Vodafone India, the Institute of Social Sciences in Delhi, and the high court of Jammu and Kashmir. “This achievement is not my achievement alone. Everyone that I have interacted with has contributed to this. “The list of people that I have to thank is endless. I'm highly indebted to my professors at GNLU, teachers at IMI and Modern Public School and the staff at each of these institutions. “One person who has inspired me the most is my batchmate at GNLU, Gayathree Devi. I've learnt a lot from her and this one goes to her. He plans to study Comparative Human Rights Law, Criminal Justice, Security and Constitutional Theory in the BCL programme at Oxford. Last year the Rhodeses went to NLSIU Bangalore's Vanshaj Jain, Nuals Kochi's Mary Kavita Dominic and NUJS Kolkata's Gauri Pillai. Read our full interviews with them from last year about the secret Rhodes sauce. In 2015, CLC Delhi University's Bahuli Sharma and NLU Delhi's Rishika Sahgal had won the Rhodes. But, until fairly recently, the Rhodes list of lawyers from India had almost exclusively been dominated by graduates from NLSIU, Nalsar and NUJS. We are reaching out to all scholars for comment and are looking to confirm if any other lawyers have also won the Rhodes this year, and will update the article as and when. 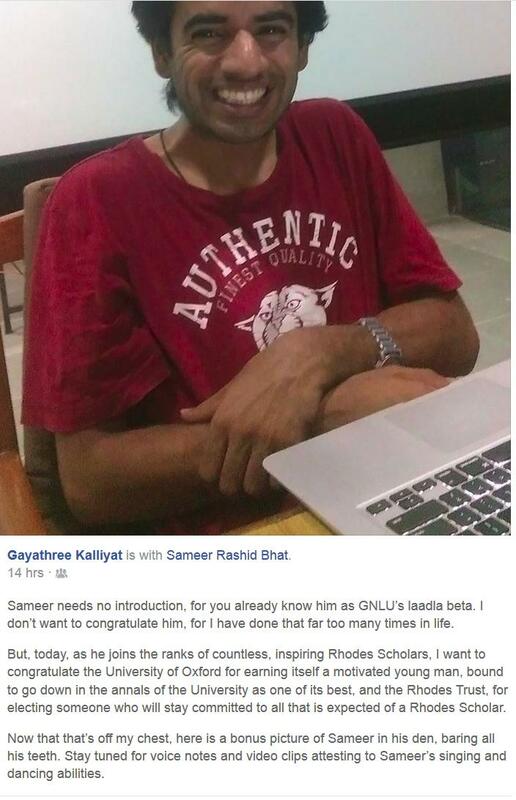 Truly wonderful to finally have a Rhodes Scholar from GNLU. It is a moment of pride for alumni such as me to see this day. Well done, Sameer! Please give credit to Prof Bimal Patel who you have been maligning all along. When a team does badly the captain gets the blame but when a team does well the captain should get credit. If we're talking team play, we should have also given credit to his parents, his high school teacher and Narendra Modi then? First, Rhodes is largely an individual achievement rather than an institutional one, which Rhodes has finally realised by looking beyond just the NLS tag as they used to. Second, Sameer didn't seem to mention or credit Bimal Patel in his interview - how exactly should we go out of our way to give credit to a law school's director in a NEWS article? Good to see the NLSIU monopoly ending. Thanks to some drunkards on previous selection panels CVs of excellent candidates from other NLUs were overlooked in favour of less deserving ones from NLSIU. Not generalizing, came across some obnoxious characters from NLSIU and felt they are more like MBAs aiming for Vice Presidentship/ Directorship/ General Counselship with only negligible knowledge in law and fat egos. Probably selected for such designations through contacts. The real lawyers with pure knowledge of law is missing. Sure, but you could say that about any school / college / firm / company / institution / organisation. Some people will always be pricks (and successful with or without knowing their stuff).That’s life (exhibit A, Donald Trump). Personally, I think lawyers need to start thinking more like MBAs and network more, as lawyers around the world do. Networking and building contacts are not dirty words and pretty much part of the job description of lawyers and professionals around the world - the sooner young lawyers realise that the better it is. In fact, at senior levels (not just in law but in pretty much everything) it is not just what you know but who you know. It is a very quaint notion that lawyers are supposed to be these repositories of pure knowledge and the world will find them because they radiate knowledge! Sorry, but reality is slightly more messy. You have to network/market/sell too. Yes, Rhodes panel have nothing better to do but worry about law school rivalries. Get over your insecurities and give Rhodes panels some credit - they select on merit. Great news that scholars are being selected from diverse universities but that shouldn't take away from previous scholars, just because they are from a particular law school that you don't appear to like. Kian is a real rogue. He downplays problems at NLSIU and gives excess negative coverage to other NLUs. Meanwhile minor achievements by NSLIU alumni are overhyped.